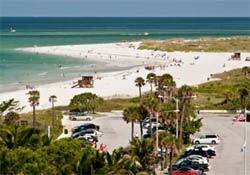 Located 30 minutes drive south of St Pete's, Sarasota is a seaside town, bordered by barrier island beaches. Although it lies in a fairly quiet region of Florida, it is a gathering place for a surprisingly large amount of cultural events. The best known of Sarasota attractions would have to be the John Ringling House and Museums containing an impressive Baroque art collection. Sarasota is also the home of several other museums and gardens, perfect for perusing while trying to avoid the afternoon heat. When the sun dips a little, you can hit the beaches for swimming, surfing or to charter touring or fishing excursions. Shopping is as upscale as many of Sarasota's other attractions. Galleries, boutiques and furniture stores fill the many shopping areas. However, if your wallet isn't quite big enough for some of these designer stores, you should know that Sarasota also sports a couple of outlet centers that offer shoppers large discounts on some of the same items. Following its love for jazz, Sarasota hosts the Jazz Festival every April, drawing big names from all over the U.S. and even other countries. Aficionados: this is a must-see! Earlier in the year, Sarasota pays tribute to its Scottish heritage with a festival of Highland games and culture. A bit later, immerse yourself in the Medieval Fair at the Ringling Museum of Art, complete with jousting matches and spit-roasted turkeys!